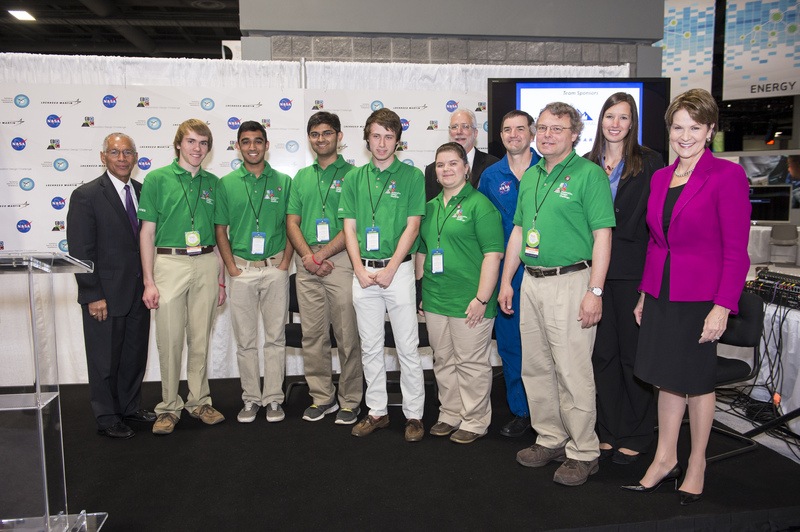 After a year-long competition among high school teams across the country, evaluators from NASA, Lockheed Martin and the National Institute of Aerospace have selected Team ARES, from the Governor’s School for Science and Technology in Hampton, Va., as the winner of the high school portion of the Exploration Design Challenge (EDC). The announcement Friday came during a ceremony held at the opening of the 2014 USA Science and Engineering Festival in Washington. Team ARES was chosen from a group of five finalist teams announced in March. The EDC was developed to engage students in science, technology, engineering and math (STEM) by inviting them to help tackle one of the most significant dangers of human space flight — radiation exposure. Team ARES now will work with the NASA and Lockheed Martin spacecraft integration team to have the product of their experimental design approved for spaceflight. Once the equipment is approved, engineers will install it onto Orion’s crew module. Later this year, when Orion launches into orbit during Exploration Flight Test-1 (EFT-1), Lockheed Martin will host Team ARES at NASA’s Kennedy Space Center in Florida to watch their experiment launch into space. During the EFT-1, Orion will fly through the Van Allen Belt, a dense radiation field that surrounds the Earth in a protective shell of electrically charged ions. Understanding and mitigating radiation exposure during Orion’s flight test can help scientists develop protective solutions before the first crewed mission. After EFT-1, the students will receive data indicating how well their design protected a dosimeter, an instrument used for measuring radiation exposure. Students around the world in grades K-12 still can be part of Orion’s first flight by completing an online radiation shielding activity. Students who complete the activity by June 30 will have their names flown as virtual crew members aboard Orion. To learn more about the EDC and related activities, visit: http://www.nasa.gov/education/edc. To learn more about NASA’s education programs, visit: http://www.nasa.gov/education.